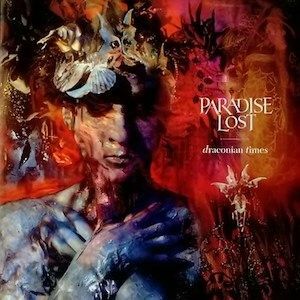 PARADISE LOST - DRACONIAN TIMES VINYL (2LP) | Online Shop | Wizard LTD. Album: "DRACONIAN TIMES VINYL (2LP)"
Paradise Lost formed in Halifax, West Yorkshire in 1988 and are known for being the founders of the Gothic Death/Doom Metal genre; a style fully brought into existence with their genre-defining second album, the highly influential 'Gothic' (a heavy source of influence for countless bands including Katatonia). Having released 2 albums, including 'Gothic', for the UK's Peaceville Records and later helping to establish Peaceville as home to the finest trio of UK doom bands (alongside My Dying Bride and Anathema), Paradise Lost then signed with fellow UK label, Music For Nations. The band went from strength to strength as their writing developed, perfecting the heavy doom compositions while incorporating more rock elements, which eventually led to the band breaking through to mainstream rock and metal audiences. The seminal album, 'Draconian Times', was originally released in 1995 on Music For Nations and was seen as a new pinnacle of Gothic Doom metal, featuring classic tracks such as 'Hallowed Land', 'The Last Time' and 'Forever Failure'. The album was recorded at Great Linford Manor and Ridge Farm Studios, England, with the prolific writing partnership of Holmes and Mackintosh creating something beyond even their previous albums, whilst retaining the strong union of atmosphere and melody, particularly with the identifiable and often copied guitar tone and playing style. 'Draconian Times' is often referred to as the peak of the band's creativity, and established Paradise Lost as a truly world class act. This vinyl editon is numbered and limited to 2000 copies and comes on double 180gsm black vinyl, in a gatefold sleeve and printed inner sleeves and liner notes from the album's producer Simon Efemy.